Want to play in the beta of Star Trek Online? All you have to do is click. I've been charting courses in Star Trek Online for the past week or so. The latest MMOG from Cryptic has you commanding your own ship and leading away-teams on distant planets from the start, after you spend hours with the incredibly detailed character generator, crafting the ideal Star Fleet Captain. After I've played the latest build, and try out the recently added Klingons, I will write a more in-depth preview. 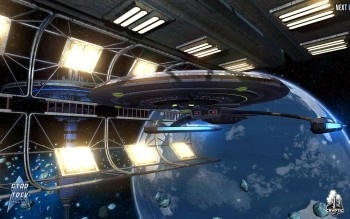 If a beta key for Star Trek Online is in your dilithium chamber, then go here to enter. The first 2000 people who sign up will get a key.